Our area of Western North Carolina is full of unique natural wonders and unforgettable scenery that makes it a truly unparalleled vacation destination. Our Cabins on the Blue Ridge Parkway cater to those who visit North Carolina—and particularly the Linville NC area—to take in all of the spectacular views and enjoy the unspoiled wilderness through North Carolina Fly Fishing, Hiking Trails Grandfather Mountain NC, backpacking, horseback riding, golf, and any of the other innumerable outdoor activities that are well-loved by locals and visitors alike. Linville Gorge NC is the perfect place for visitors to our Western NC Mountain Cabins Rentals to indulge in all of their favorite outdoor pastimes. This enormous protected area is full of recreational opportunities like hiking, mountain biking around the gorge, rock climbing, camping, and just general sight-seeing. Linville Gorge North Carolina is one Western North Carolina Attraction that you won’t want to miss when you stay at our Vacation Rentals Western NC. Carved by the Linville River, for which our Rental Cabins Western North Carolina are named, the Linville Gorge North Carolina is often referred to as the “Grand Canyon of North Carolina.” One of the crowning jewels of the Blue Ridge Mountains, this breathtaking landscape is home to a variety of unique geological formations, including Table Rock, the Chimneys, Hawksbill, and Sitting Bear. Too steep to develop and designated as a wild area since 1951, the twelve-mile, 12,002-acre gorge is also a haven for many plant and animal species. Bear, deer, squirrels, raccoons, grouse, owls, hawks, and trout all reside in the dense pine and hardwood forests that surround Linville Gorge NC, and flora such as rhododendron, azalea, turkey beard, orchids, and wild indigo make their homes on the steep slopes of this spectacular Western North Carolina Attraction. Close to our Cabins in Pisgah National Forest, Linville Gorge North Carolina is a wonderful place for Backpacking North Carolina, Hiking North Carolina, camping, and mountain biking. Since Linville Gorge NC is a true wilderness, with no bathrooms or shelters of any kind, those North Carolina Hiking should exercise caution and good judgment. The 39 miles of North Carolina Hiking Trails in Linville Gorge NC range in difficulty from moderate to strenuous, and are ideal for more experienced hikers, though certain trails are popular with beginners. Those interested in Camping Grounds in North Carolina will also love Linville Gorge NC. Permits are required for camping on weekends and holidays from May 1st through October 31st; they are not required during the period of November 1st through April 30th, nor are they required for those visitors who do not stay overnight. Permits are free and can be obtained at the District Ranger’s Office in Marion and the Linville Gorge NC Information Cabin. Though not permitted within Linville Gorge North Carolina, mountain biking is permitted around the gorge. There is no better way to take in the splendid views of this one-of-a-kind Western North Carolina Attraction. Like the Hiking North Carolina trails, mountain biking at Linville Gorge North Carolina is better suited for those with a good deal of experience. These strenuous trails range in length from 8.2 miles to 49 miles, and are perfect for experienced mountain bikers that want to be challenged while enjoying breathtaking views of Linville Gorge NC’s unique geological formations. Our Western NC Cabin Rentals are perfect for those who want to enjoy the comforts of home, while being close enough to spectacular wilderness areas to partake in some of their favorite activities. Mountain biking, Camping Grounds in North Carolina, Backpacking North Carolina, and North Carolina Hiking are just some of the activities that can be enjoyed at Linville Gorge NC Wilderness Area. What better way to relax after a trip into the unspoiled wilderness of Linville Gorge North Carolina than by soaking in the hot tub in one of our Cabins Hot Tub Western North Carolina, or relaxing to the gentle murmur of the Linville River on the deck of one of our Western North Carolina Cabin Rentals? 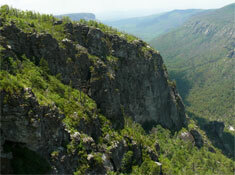 Our Western NC Cabin Rentals are ideal getaways for anyone looking for Linville Gorge Lodging. Whether you’re celebrating a birthday, and anniversary, hosting a family reunion, or just looking for a peaceful Linville NC getaway, our Linville North Carolina Cabin Rentals Lake River Creek Pond are close to all of the best Western North Carolina Attractions. A visit to Linville Gorge NC will make your stay at our Western NC Mountain Cabins Rentals an unforgettable one!